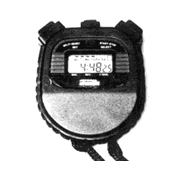 Franklin offers several models of highly accurate, Digital Stopwatches for a wide range of uses including laboratory, sports, school, home, industry, training, racing, testing, and games. All Franklin Stopwatches feature water resistant, shockproof A.B.S. plastic case construction and meet or exceed the stringent requirements of U.S. Government Commercial Item Description (CID) A-A-1453B dated April 10, 1992. Model # SW601 ¼ ” numeral height, six digit display of minutes, seconds and hundredth up to 29:59:59 then displays hours minutes and seconds to 23:59:59. Single action, time in/time out, cumulative lap and continuous time. Also displays time of day in 12 or 24 hour format, date and alarm. With lanyard and instructions.